HERE IS ANOTHER CHRISTMAS CRAFT GIFT IDEA MY SIS AND I MADE LAST YEAR! KIDS will especially love it! THIS DIY idea was ACTUALLY MY LITTLE SISTERS IDEA… YES’ we get the creativity (sarcasm) from our wonderful mother, who has many creative talents. My little sister and I wanted to make a bunch of handmade Christmas crafts to give to friends, neighbors, etc. 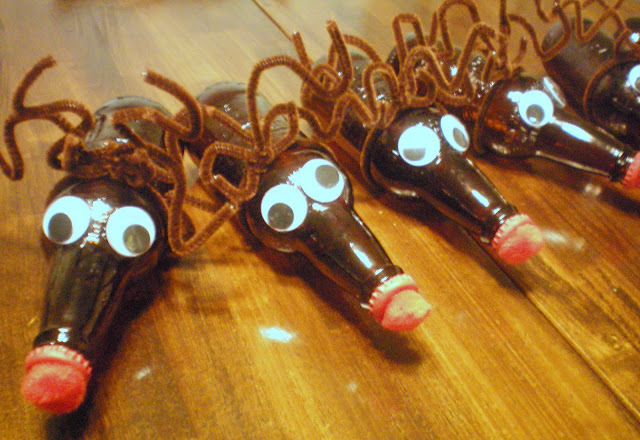 So we made Rudolph the Root beer Reindeer bottles. This is a no brainier, its ubber easy to duplicate! To start pick up root beer bottles from the store “IBC Diet Root beer” are the ones we used. LOAD up on lots of soda… HA! we emptied ours and filled them with treats, but you most certainly can leave the soda in them. 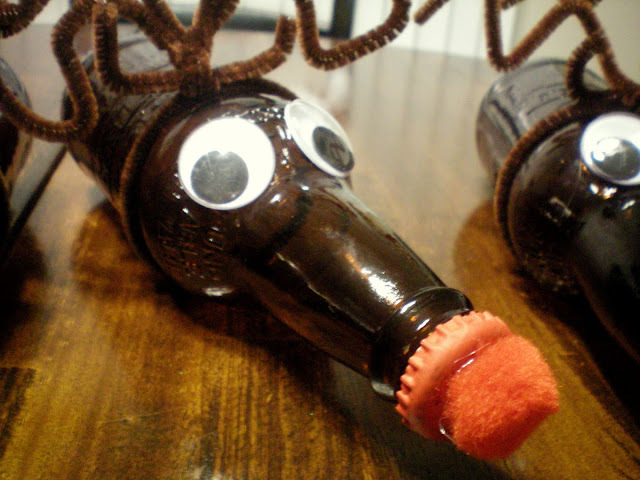 FIRST- Wash them, then paint the lids red with acrylic paint, hot glue red pom poms onto the lids, hot glue googly eyes, and tie “3” pipe cleaners around the root beer bottles to your liking and ……. “Merry Christmas from Rudolph the Rootbeer Reinder” Love, the Larsens! I am linking up with Tatertots and Jello for the Weekend Wrap Up Party HERE. I think this would be a great gift to hand out WITH rootbeer at holiday parties! Love it! This is so great. I am thinking about doing this as an on hand gift for the drop ins with some uncooked popcorn bags covered with scrap paper that will match the scrap paper on the bottle holder! (This way we can have it if no one drops in!) Love this! I love RootBeer and this is so cute!! I may have to make some of these. Thanks for sharing. hey jen, this is too cute!! we love rootbeer too, fun! What a FUN idea! That would go over BIG at my house! My kids love Root Beer! CUTE, CUTE, CUTE! I’m having a GIVEAWAY at Deck The HALLS! “CHRISTMAS JOY” from the Twelve Days of Creative Christmas! Your Christmas cards are adorable! 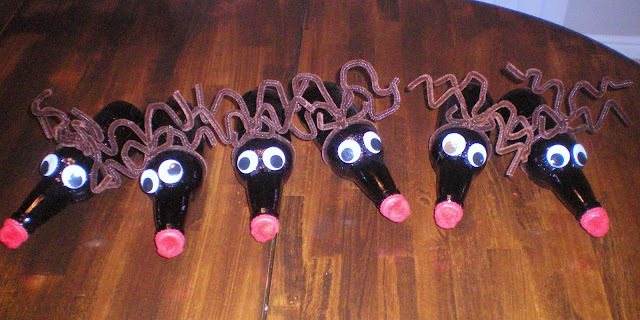 These made me laugh…this would be a fun party favor! A BIG THANKS! YOU’RE AWESOME~!! That’s such a cute idea! I might have to use that for neighbor presents. Jen this is too cute, would def make a great centerpiece for a kids meal. Thanks for sharing, and I would LOVE if you came to link this up to my **6 weeks 2 JINGLE** special party. Where it’s all things Christmas. I don’ t think you have ever participated in my weekly party and I would be so happy if you shared some of your creations there. Oh and stop by soon, I will be reaching my 100th follower today ( I hope), and have a REALLY sweet GIVEAWAY coming soon. YAYY, I’m so excited, can you tell, he he. This are soooo adorable!!! My kids would love this. Very cute! My kids LOVE root beer and this would be a great festive idea for popcorn and movies night! This is too cute!! This would be way fun for kids to make!! I’m bookmarking!